1. Aesop's "The Lamb and the Wolf"
A wolf pursued a Lamb, who fled for refuge to a certain Temple. The wolf called out to him and said, "The Priest will slay you in sacrifice if he should catch you" .On which the Lamb replied, "It would be better for me to be sacrificed in the Temple than be eaten by you." 2. During the Civil War, General Ulysses S. Grant said he heard a pack of "not more than 20 wolves" while his troops were traveling. However, when he reached the pack he realized that only two wolves had made the howling noises. 3. Wolves howling in a chorus use wavering or modulated howls to make it difficult for rival packs to determine their location and size. In addition, as the sounds move through the air and bounce off objects and echo, they become even more confusing to others. This phenomenon is called the Beau Geste Effect. 4. Aesop's "The Dog and the Wolf"
A gaunt Wolf was almost dear with hunger when he happened to meet a Dog who was passing by, "Ah, Cousin," said the Dog. "I knew how it would be; your irregular life will soon be the ruin of you. Why do you not work steadily as I do and get your food regularly given to you?" 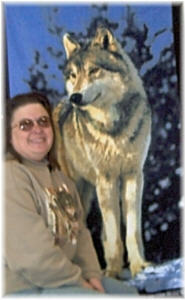 "I would have no objection," said the Wolf, "if I could only get a place." "I will easily arrange that for you" said the Dog. "Come with me to my master and you shall share my work." So the Wolf and the Dog went towards the town together. On the way there, the Wolf noticed that the hair on a certain part of the Dog's neck was very much worn away, so he asked him how that had come about. "Oh, it is nothing," said the Dog. "That is only the place where the collar is put on at night to keep me chained up, it chafes a bit but one soon gets used to it. "Is that all?" said the Wolf. "Then good-bye to you, Master Dog." Moral: Better to starve free than be a fat slave. 5. The position of a wolf's ears can be used to tell where it stands in the pack's hierarchy. Alpha wolves always keep their ears erect, while lower ranking wolves often keep them flattened, particularly when they approach an alpha wolf. 6. The largest wolf on record was captured in Alaska and weighed in at 175 pounds. 7. The Maned wolf is known by some as the Stilt-legged fox and has the characteristics of a wolf, dog, fox and hyena. Maned wolves are about three feet tall shoulder height and weigh about 50 pounds. They have golden-red fur with black legs and black manes. 8. The front paws of wolves have five digits, including a dew claw--and their back paws have four digits. Wolves walk on their toes, which allows their paw cushions to absorb the impact of rough spots on the ground, for greater comfort, agility and speed. 9. Now I see the secret of the making of the best person. It is to grow in the open air and to eat and sleep with the earth. Walt Whitman.